See what doctors and patients are saying. Our patients couldn’t be happier. Time and again, patients make it a point to tell us how delighted they are with both their results and the entire process, from initial consultation to completion. Click here to see what patients are saying and how Andolino Orthodontics stacks up. Jerry doesn’t always go to the orthodontist, but when he does, he goes to Andolino Orthodontics. Dr. Andolino is great and the office staff seem to have great communications. I wasn’t sure I would be able to pay for treatment but the payment arrangements that where set up make it easy for me. Dr Andolino was amazing with my orthodontist treatment and I would highly recommend him to everyone. That includes people of all ages. As I sat in the chair month after month and saw people of all ages,and watched his extreme gentleness,and his explanations, I knew I had finally got to the right chair. In the 1950s and 1960s, I lived in the “Third World” (developing countries) where orthodontic treatment was not available during my youth when treatment would have been optimal. Already in my 50s when I started orthodontic treatment in the early 1990s, I encountered a problematic situation with the orthodontist who was treating me and was compelled to find another doctor. I was “rescued” by Drs Boylan and Andolino who completed my treatment in a most satisfactory manner. Although nobody likes going to doctors and dentists, I can say it was a pleasure to go to their practice and I actually looked forward to my appointments due to the friendliness and professionalism they showed me. I am always grateful for their help and friendship. I might add that they are reasonably priced when one takes into account the quality of care and service provided. Everyone in the office is highly professional, competent, and kind. Everything is explained in detail and any problems are addressed immediately. This truly is the best place to help create your best smile! I had an excellent experience at Andolino Orthodontics. The location is very convenient and the entire staff was very kind and professional. This was a very positive experience! I highly recommend Andolino Orthodontics! I first met Dr. Andolino when he joined the practice he now owns toward the end of my own treatment, 20+ years ago, and now send my children to him. He is outstanding in every sense. He is completely informed about the most recent advances in orthodontics, yet does not jump on the latest bandwagon, using his vast knowledge and experience to judge the value of new technologies. His gentle, reassuring manner puts even the most anxious patient at ease. And his staff–among whom there is very little turnover–are clearly well-treated and well-mentored. It may seem superficial, but his offices are also exquisite–if you have to sit in the chair for an hour-long procedure, it really helps to have a spectacular south-facing view of Manhattan! I would recommend–and have recommended–Dr. Andoloio unconditionally. i always kill people with kindness. but. when i smile it seals the deal! Muchas Gracias…. I first came to this office 12 years ago for adult braces. I was incredibly happy with the results. I had a retainer on the back of my front teeth for many years. For some reason I hit my mouth TWICE in one month. I guess I was scheduled to loose my teeth. The second hit was from my 45 pound puppy. The teeth were possibly 20 -30 back but the retainer held them. I called and was in Dr Andolino’s chair in an hour. He saved the teeth and I was on stage that night doing a production of TARTUFFE! Really…I do look forward to going to Dr. Andolino’s office. Everyone is really nice and helpful. The office is very pleasant and comfortable. Love the pictures in the treatment rooms. My treatment went exactly as expected and I am thrilled with the results. As an adult who finally made the decision to get braces, I was a bit concerned that I would find myself in the waiting room with all pre-teens but the patients are a nice combination of many ages. Overall, a great experience. Extremely professional service. Suggested treatment options are thoroughly explained, both in terms of treatment and associated costs. I would highly recommend to anyone considering Orthodontics. Dr. andolino did an excellent job straightening my teeth with the interior braces. His price was way more reasonable and included more services than some of my friends who used different orthodontists. i finished my treatment maybe 4 years ago and my teeth have remained straight and i have had no problems at all. in fact due to the splints on the back of my front teeth i was probably spared an implant since the splint kept my tooth in place while the problem was corrected. Thank you for the professional care, friendly expert staff, and the experience, expertise, and humanity of Dr. Andolino. And of course, the beautiful results. title says it all, the service provided is excellent, the staff is friendly and professional and the care is state of the art, however the fees are very high. I am completely satisfied with the work Dr. Andolino has done. My teeth look great. The entire process went very smoothly. I will definitely use him for my children! I highly recommend him for adults and children! Dr. Andolino & his team are extremely thorough, personable, and professional. From the beginning of my invasalign treatment to the end, in total six months, each visit was met with a smile and an in depth explanation of what the appointment would entail. I would not hesitate to recommend Dr. Andolino to my friends, family, and when my kids are old enough he will be my first stop for braces if necessary! I was nervous about the procedure I was considering and was doing a fair amount of research on the internet to learn more. I came across Dr. Andolino’s site, then researched his credentials, then finally took the first step and made an appointment. The summary is, from that first appointment to completion of my procedure and now, three years later in maintenance mode – this has been the best dental experience I have had. Excellent in every way. very, very kind and friendly staff! wonderful with pre-teens/teens. extremely low turnover in office (we have been going for a few years – and not sure anyone has left!) which speaks volumes for dr andolino and his practice. I recommend Dr. Frank Andolino’s practice 100%. I had been to a few before deciding on my orthodontia treatment. I had a minor underbit and most orthodontists I visited recommended I go through a major surgical procedure. Dr. Andolino immediately suggested a less dramatic procedure for such a minor underbit. Since my treatment has been completed Dr. Andolino and his staff have been very accommodating to post treatment visits. They are very on top of the game and medical advancements. Several of my family members are his patients and I will continue to refer family and friends. I had an amazing experience and never thought my teeth would look the way they do now. Dr. Andolino and his team answered every question and did every little adjustment I asked for so very patiently. Dr. Andolino, Melissa, Abdul, Sunny, Stephanie thanks a million for everything. Notwithstanding that I wore braces as a child, when I moved to Manhattan nearly 40 years later, my new dentist told me if I didn’t have braces my teeth would fall out! I was referred to Dr. Andolino’s office and they were professional, kind and did an outstanding job on my teeth. I still have a wire on my lower teeth which doesn’t show and more importantly, prevents my teeth from moving out of line. I also have a bruxism splint for TMJ which is fantastic and I can’t sleep without it. Dr. Andolino is an extremely talented and dedicated orthodontist. In addition, he is actively involved in a program which provides free dental care to people in a third world country. He goes there to treat needy people as well as helps run the program through the government in that country. No punn intended, but he puts his money (and self) where his mouth is. I greatly appreciate and admire Dr. Andolino’s talent as well as the fact that he cares and gives back to others. Having a particularly challenging dental case that has kept me in braces for over 5 years, it can be frustrating…that being said, I am so happy to have Dr. Andolino and his team to work their magic! It is amazing how my teeth have changed and how smooth they have made the process under the circumstances! The staff is friendly and welcoming. I’ve always felt comfortable…almost like family!!! I can’t say enough about the service…I would recommend Dr. Andolino and team with full confidence to anyone! My first time was very interesting. Dr. Andolino showed me step by step what I will have to do. I hope i can start right away. I would highly recommend Dr. Andolino to anyone who is hesitant about getting orthodontic work done. After visiting MANY orthodontists, it became clear that Andolino Orthodontics was where I felt most comfortable. This process has been far less painful and worrisome than I expected because I truly feel I am in the best of hands at this office. The wonderful staff also makes my visits relaxed and time efficient with their excellence. I didn’t have to wait long to be seen. I was treated with respect in a friendly professional manner. The building is historical and the waiting room environment is lovely. The rooms are equipped with cutting edge technology. Doctor Andolino has a great ‘chair side manner’ and has more extensive experience with Invisalign braces than you’re likely to find elsewhere. He is careful to explain a variety of alternatives and procedures that can work for you. He is also interested in knowing that you have understood what has been said and entertains questions with interest. Plus, he’s handsome. The staff is highly professional and nice. II was delighted to be offered a selection of coffees and tea and magazines while sitting in the chair. There’s even a menu of flavors for the impressions! Stay away from chocolate. I recommend cinnamon and mint… but who knows? You may have a taste for bubble gum or blueberry! Very cool aesthetic. Not how I remembered getting braces as a kid. From the moment you walk in until the moment you leave you’re in great hands. Learning my teeth were shifting and I would need braces as a 30-something woman, needless to say, did not thrill me. I interviewed several of the “top” NYC orthodontists but knew I found my doctor when I met Dr. Andolino. My treatment was efficient and painless and the result is terrific. There is rarely a week that goes by when someone doesn’t compliment my teeth. Dr. Andolino has a wonderful eye and a gentle touch and is very patient. He’s a craftsman as much as a dentist. wonderful office for orthodontia…..dr andolino is warm, kind, caring. staff is always friendly and attentive. would highly recommend. Entire Staff is friendly and kind. Would highly recommend. Results were great. The team is skilled; they have a great rapport amongst themselves and their clients. At all levels, they have a solid customer service focus. I would highly recommend Dr. Andolino and his team. I just wanted to send an unsolicited note of thanks. You straightened me out! For as long as I can remember, I was always too shy to smile- even in private. I was extremely self-conscience about my “crooked” teeth. But thanks to you, I cannot stop smiling, which, as you can imagine, has added a tremendous amount of much joy to my life, and to those in my life. You and your team have been incredibly professional; but more important, you have all been so hospitable (not a word usually used to describe about a medical or dental visit). Everyone really seems to care, and their authentic warmth is really amazing. I think that if every company provided that kind of service, the world would be a better place. And while this may seem dramatic, it is true. Thanks again for the new lease on life and for the great lesson in business. I have been a client of Dr. Andolino’s for the better part of 20 years. Since I was ten, I have always felt, literally, “in good hands”, with him and his staff, as I did with his mentor Dr. Boylan. They “get it”. No ego there, but trustworthy family practice, something that can be hard to find in medicine today. He has also treated my fiance, and she loves what he has done for her. It is with gratitude that I thank him for the kindness and care he has given to me and my family. Both my daughter and I had a great experience with this practice. I run a large sales organization and hesitated for years to get braces and correct my teeth. Dr. Andolino recommended lingual braces which made the process invisible to customers. As I researched, I found that this practice really has the most experience in working with this appliance in the city. The staff and Dr. Andolino anticipated and communicated all of the things necessary to help me adapt quickly to wearing the braces. They were very attentive, and any issue I had was dealt with by Dr. Andolino personally. I felt like both he and his staff were really dedicated to making the outcome as perfect for me as possible. The whole process took about a year, which was faster than expected and the end result (my smile) exceeded my expectations. My daughter is a teenager, and used standard braces, and had the same results (and even finished faster!). I would highly recommend this group of professionals. The whole team really went above and beyond to make the customer experience and outcome as good as we could have possibly expected. When my mouth went south in adulthood, I searched high and how to find an Orthodontist to lead the ship on my oral care and found that person with Dr Andolino. He not only gave me perfectly healthy and straight teeth, he worked with my to find the best care for my lifestyle. We tried a few different brace options and today my teeth are prettier than ever. The office is beautifully appointed with photos Dr Andolino has taken on his many adventures around the world. Just ask and he’ll share and anecdote and a smile with you!! The staff are attentive, polite and always very pleasant. I couldn’t recommend Andolino Orthodontics more! I had my first braces experience with Dr. Andolino back in middle school when he shared the practice with Dr. Boylan (who treated my mother when she was in her 20s). Recently, I needed braces again to correct a major jaw misalignment, so I went back to the pros. Andolino predicted 9 months to a year to correct the problem, and just over a year later, the results are wonderful. I’m always impressed by the friendliness and professional expertise of the staff: they are always very attentive. I highly recommend this practice. My experience at Andolino Orthodontics was absolutely amazing. From the minute I walked into the door the friendly staff was helpful and made me feel right at home. The gorgeous and comfortable space feels more like a living room than an office, and the service was always above and beyond accommodating. Dr. Andolino’s attention to detail, clarity, and caring refined work proved to produce amazing results. His depth of knowledge concerning all of the leading edge options for treatment is reassuring and innovative. Throughout the entire process, the support from Dr. Andolino and his office was unwavering, and I confidently recommend his services to anyone looking for an Orthodontist. Going to Dr. Andolino was an experience I will treasure the rest of my life. I was referred to Dr. Andolino by my periodontist who had noticed a tooth threatening situation which could be resolved orthodonticly. Not only was the problem resolved, but I now have the most beautiful smile, and the healthiest teeth and gums. I actually miss going to the office which was in the Fuller building, with Dr. Andolino’s stunning wildlife photographs taken in Africa where he has a charitable clinic. Dr. Andolino’s professional expertise and highly personable manner is mirrored in his staff who are all top notch and manage to treat you as though you were the dearest friend. How’s that for going to the dentist? This is a 5 star practice in every respect that I highly recommend. Dr. Andolino is fantastic! I had braces when I was younger and never used my retainers so my teeth had shifted. Dr. Andolino suggested Invisalign and the end result is amazing. The staff at the office are incredibly helpful and are always willing to answer questions and accommodate my crazy schedule. I was told that my anterior open bite was the most difficult bite to correct and/or that my bite could not be closed. It had opened so much that I was in tremendous pain and could not eat properly. I saw a prosthodontist, an oral surgeon and two other orthodontists. The prosthodontist told me that he could not build my teeth up sufficiently to close my bite. The oral surgeon said that it was risky at my age to consider surgery and that he would have to break my jaw to fix my bite. The other orthodontists told me that they would have to insert metal anchors in my mouth and that I would have to wear meta l braces. 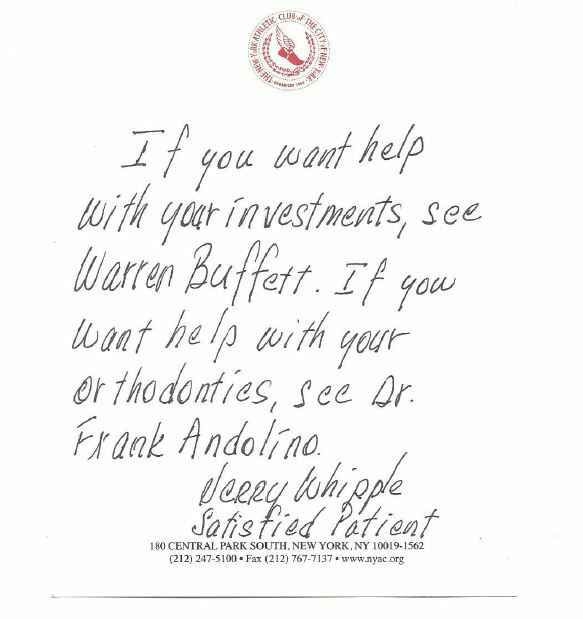 I was sent by a Dr. Bert Goldfinger, a compassionate and caring dentist, to Dr. Frank Andolino who is another compassionate and caring individual. He recommended Invisalign. I zealously followed his instructions. My bite closed. I got my wish. Dr. Andolino is the Wizard of Oz. Thank you so much.